One lucky winner receiving a brand-new Singer "Curvy" sewing machine—plus their project will be featured in a Singer ad appearing in CRAFT magazine. The three runners-up will get a Singer rolling sewing machine case and a 1-year subscription to CRAFT! Check out the post on CRAFT blog for details! Giveaway :: Winner of the I <3 Free Stuff WIP Flickr Challenge!! Sorry it's a day late, but we have a winner chosen by Random Number generator. The Winner is: Nancy of "with thread in hand" with her Sampler. Great work Nancy! You have won a Pimp Stitch Pattern booklet with 20 pages of patterns! Hooray! Thanks to everyone for participating! We're going to have another Flickr pool challenge soon, so stay tuned! I <3 Free Stuff :: Flickr Challange + Giveaway!!! We had so much fun a few weeks ago when we asked you all to "Show us Your Floss" on our Flickr group that we HAD to try it again! But we don't expect you to go to all that trouble for nothing! If you comment here with a link to your Flickr photo and submit it to our Pimp Stitch Flickr group, you could win a fantabulous prize! A Pimp Stitch Pattern Booklet!!! 20 pages worth of adorable Pimp Stitch patterns from all our artists here! A $10 dollar value! What the hey do you want a picture of, you ask? If you would be so kind as to show me what you are working on...anything at all that is a work in progress. So stop what you're embroidering right now, take shot of it and upload it to the Pimp Stitch Flickr Group (don't forget to comment with your link for an official entry) and next Friday, we'll announce the winner. You must comment to this entry with a link to your flickr photo that is also uploaded to the Pimp Stitch Flickr group. So win free stuff with your photos and flickr! We've chosen the final 2 winner for our "New Kids on the Block" Giveaway! There will be another giveaway next week so stay tuned! We chose 3 winners from the "New Kids on the Block" Giveaway event. We Still have openings for two more winners! If you made a suggestion and your blog wasn't chosen try again! Leave a comment here with a cutting edge embroidery blog and if we pick it to join our blogroll you will win a free pattern! 2 more slots to fill, so comment away! 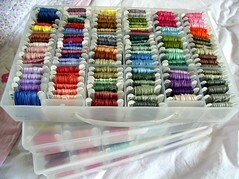 We've added some linkage to our "Blogs About Stitchery" blogroll. Check them out for embroidery goodness! Would you like to nominate an awesome embroidery blog to be added to our blogroll? Comment here and if your link makes it to the blogroll, we'll send you a free pattern! *Blog must be in part about embroidery to qualify. 5 winners max.